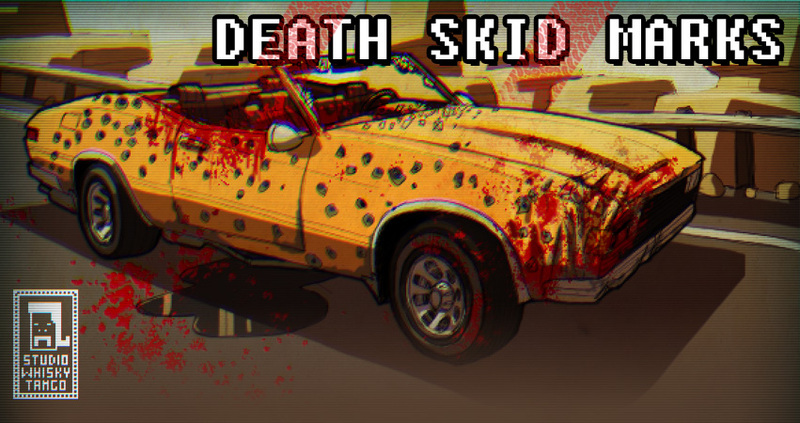 Death Skid Marks is a trashy hard as hell car combat game about a post-apocalyptic road trip to the ultimate gig. Drive 666 KMs to the ultimate concert. Battle charming people in crappy cars such as inbreds and intolerant fanatics. Arm yourself with high tech weaponry such as pistols, bricks and chainsaws. Choose how you earn money with tasks. Meet friendly but misunderstood bosses who will probably kill you often. To make this even better, there are more bosses than room for them in each runs, so you won't be able to predict what charming friend awaits. 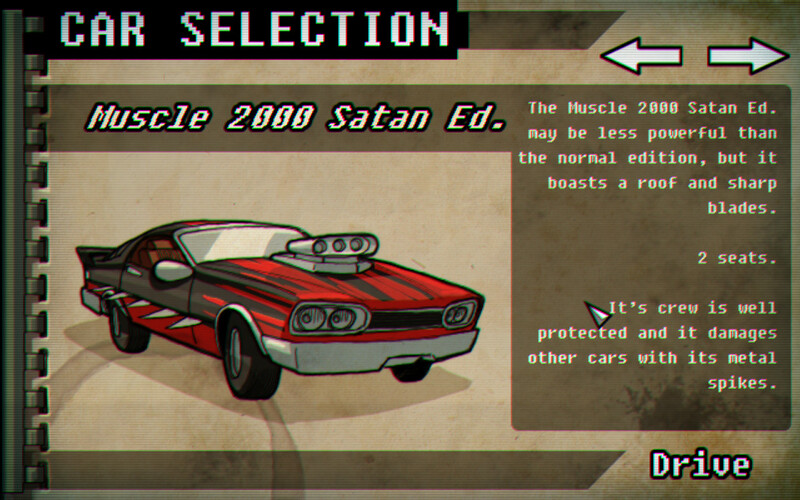 Upgrade your ride to outdrive your foes and get wasted on drugs to upgrade your stats! 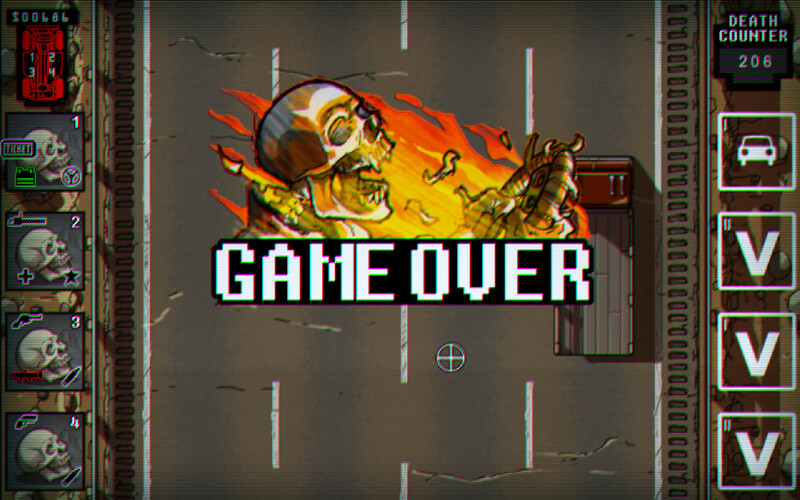 Total lack of zombies and chiptune sound samples! What is Death Skid Marks? 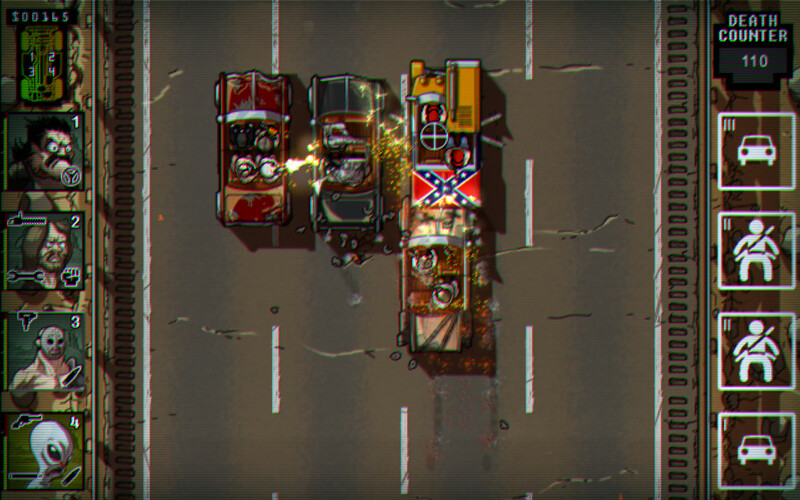 Death Skid Marks is a randomly generated car combat game. Each game is different and very challenging. We wanted to do a hard as hell but fun game with lot of replay value and hidden content. How much will it cost and on what platform? 9.99$ (USD) We will try to get it on several platforms, currently it runs A-OK on PC so there is at least that. We plan to go mobile and on other operating systems but it is too early to make any promises. The game is made to kill you the first times you play. Eventually you will get the hang of it and blaze through it. However since you can be surprised by the unpredictable, it is hoped that you won't be able to beat it while completely shitfaced. Is there a detailed story going on in there? This game is an intelligent game with a stupid coating. Everything is aimed at being absurd and dumb. The basic story is that you are a deadbeat who wants to go to a big music concert. You need to travel 666 Kms on highway 666 to get to the show. Along the way you get attacked by intolerant bastards and dangerous groupies. You will pickup up various characters to help you along the way and cross landmarks at certain points. But is it story driven? Not at all. How much profanity and violence is in there? We won't hide that it may offend those with a weak heart. So let's keep it short: Mature 17+. How much stuff is in there? Eight melee, eight range weapons and eight special weapons. You will have five cars once everything is unlocked. 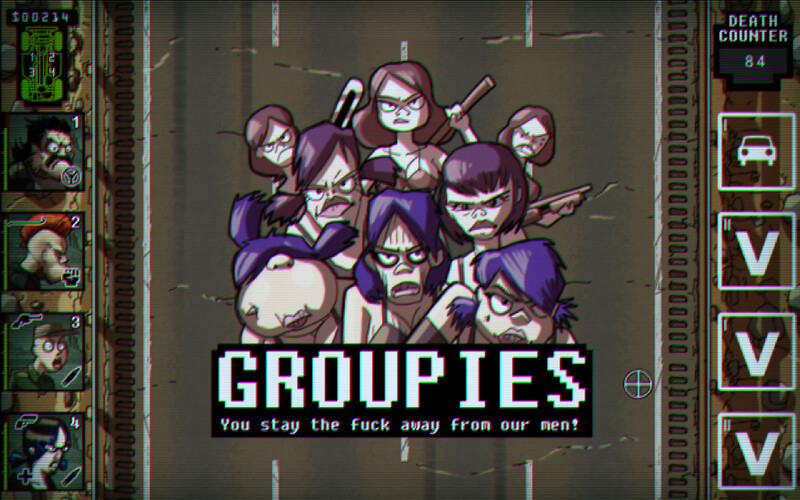 There are four gangs on the road plus groupies. 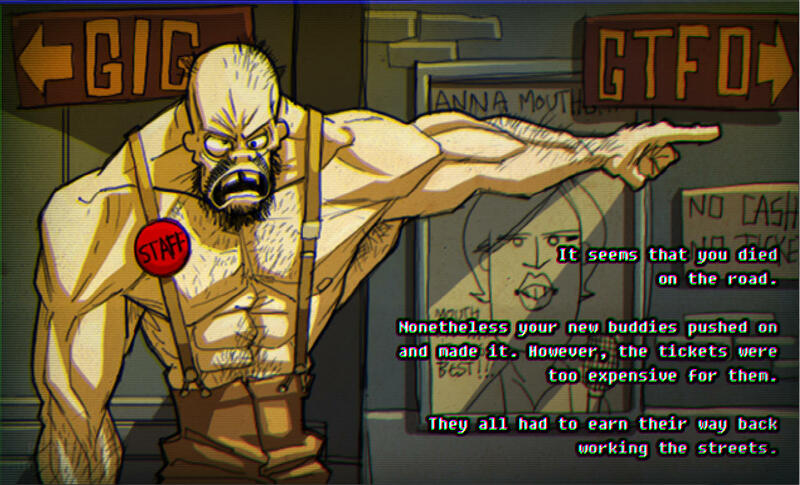 There is a dozen different hitchhikers that you can pick up and also four different endings. There are tons of different bosses even if you will cross five bosses per run. This means you will get different bosses for each game. Are the ennemies only cars? What are those silly names? There is a name generator in the game, so everyone and every place that you encounter is named. Chances are once a guy is killed, you will not see him again. How long will it take me to finish the game? If you are god and you never die, you will finish one run in about 1H30-1H. To unlock everything in the game, you will need to replay it several times. The length of the game is to make it a good game to play during lunchtime. Not now, but we have some ideas, more on that later. Why is there only one savegame? Because we don't want savegames to be used as life savers. You will not be able to save your life by saving your game since everything will be stored, so if you save just before death, you are going to die when you come back. Is it a flash game? No it is not a flash game. It runs on an engine that was exclusively made for it that we called 0ldsch00l3n9in3. It has post effects and features that could not be made with flash and it is most probably faster. 1H30 duration makes it a webgame. No it doesn't because ending a single run is far from being a finality. The point is to replay it as many times as you want without getting tired. Everything is randomly generated, every run will be different. You may play 20 hours or more before you're done with it. The more you play, the more you unlock gear, cars and characters. Tell me about the gameplay. 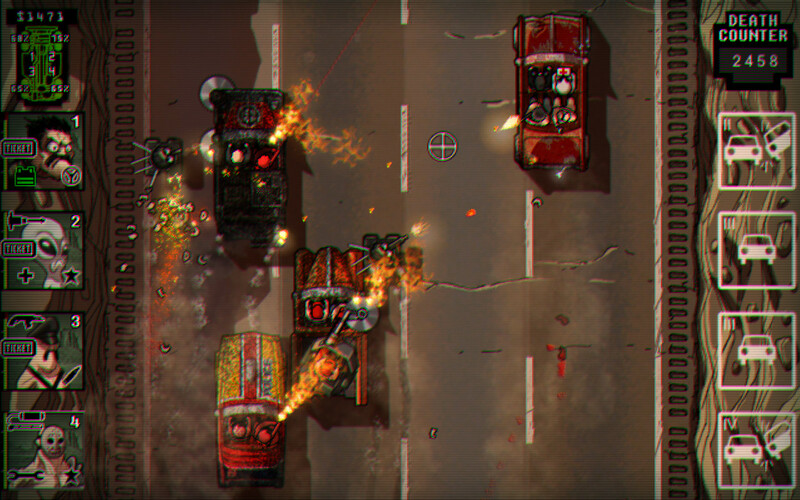 The game is about car combat. 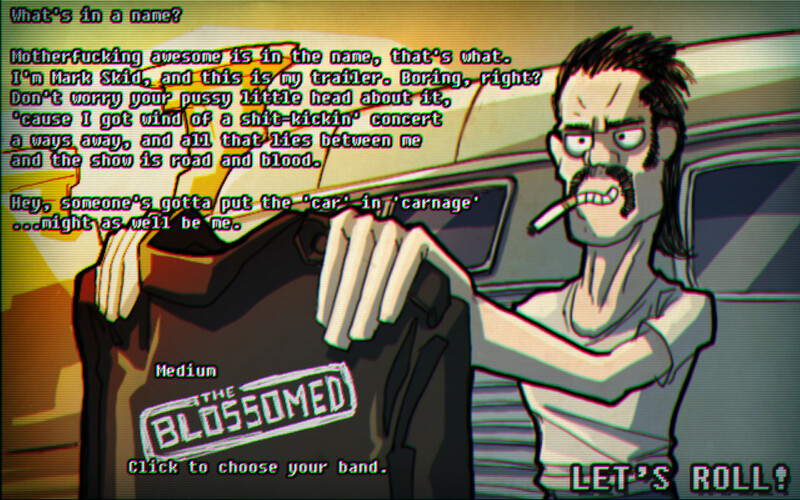 You fight your way to a music concert and upgrade your vehicle and crew along the way. Your car has 4 stats, your guys have 4 stats too. For the car, you can enhance your movement and car health. Your crew can enhance the damage they inflict with melee and range weapons and the defence they have against those weapons. You move your car around with arrows or wasd, aim and fire with the mouse. You can activate special items with 1 2 3 4, the numbers matches your different passengers in the car. From time to time you stumble upon shops where you can buy gear for your guys and upgrade your car. 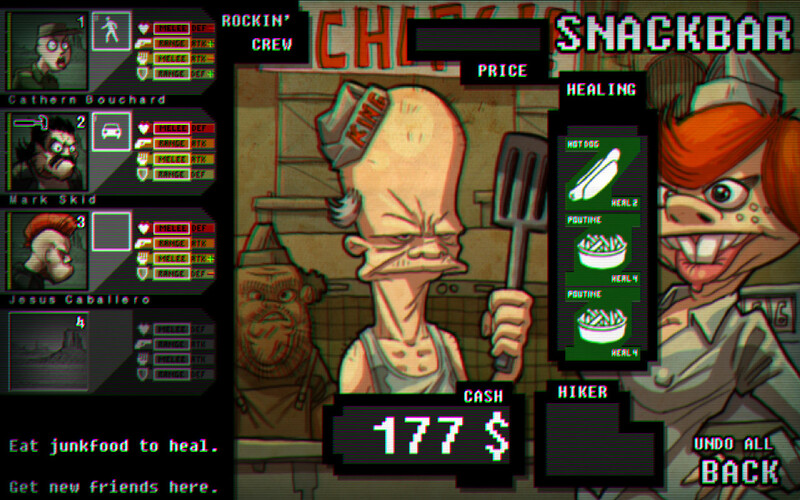 You can buy weapons, upgrades and consumable items to repair your car and heal your guys. Each one or your guys can carry one weapon and one special item, the driver can't use anything while he drives. -First, you can force him off road. Since he will probably fight back, you need to have your car upgraded (the better car pushes the lesser one). When a car is forced on the road's edge, it takes massive damage. -Then you can damage him with melee weapons. Hammer, chainsaw, torch, they all work the same, you just get close to the car and your crew will bash the other car. 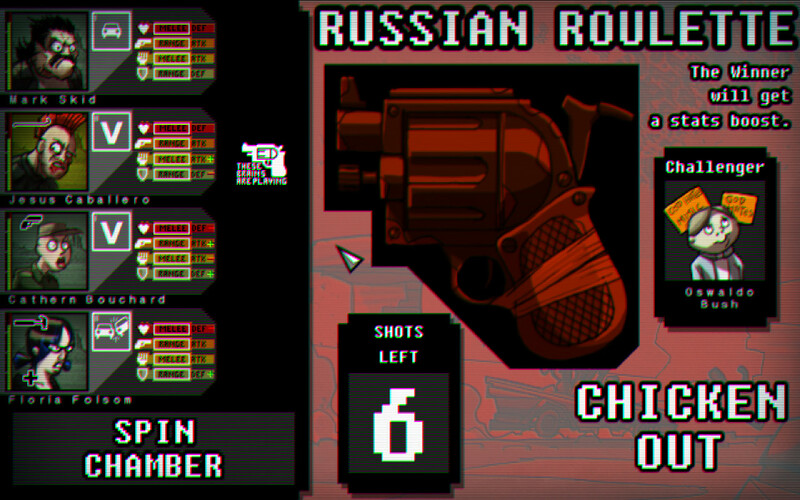 -Ranged weapons are pretty straight forward, you aim and fire. -Special weapons are one use only but they are very powerful. 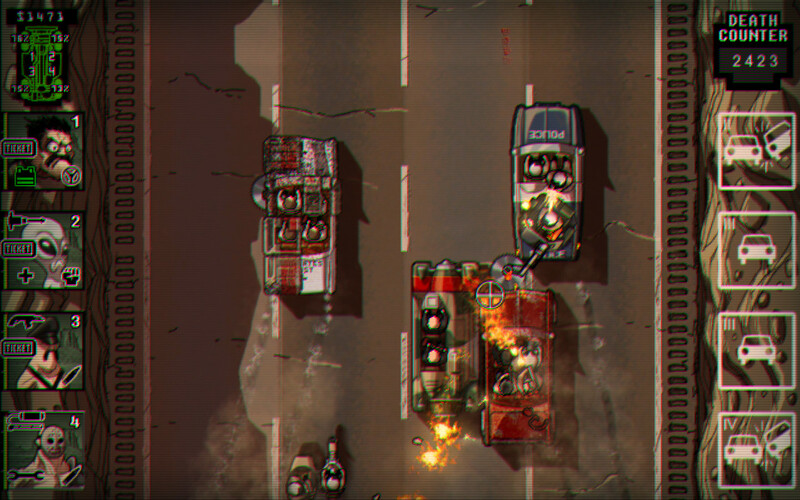 The rocket launcher for instance can kill most cars with one shot. Damage is taken by either the car or the individual passengers. When someone dies on board he stops attacking. If it's the driver however, he is replaced by one of his buddies. If everybody is dead, the car just steers and drives off road until it explodes. The car takes damage locally. If one part of the car is completely damaged, it blows up. This means that you have to be careful not to expose the most damaged parts of your car. In each shops you gather tasks. Tasks give you money for different actions. For instance maybe you would like to earn money killing crew or ramming pedestrians. Each character can carry one task, so you can try to mix them together. This really allows you to try different fighting and money making options. Don't hesitate to submit your Death Skid Marks "Let's Play" videos on Youtube/Twitch. You can download the presskit (media contents) below. Contact us if you need more info. You have our permission and our thanks. Lernie will be your best friend.